Dr. Nutt grew up on a farm near Philadelphia, Pennsylvania where he first discovered his love for horses. He earned his undergraduate degree at Cornell University, where he majored in Natural Resources and Business. After working in the environmental field for several years, he attended the University Of Pennsylvania School Of Veterinary Medicine. He received his veterinary degree in 2004 and then completed a rigorous surgical internship at Hagyard Medical Institute in Lexington, KY, where he developed an affinity for the Thoroughbred industry and an affection for foals. Following completion of another yearlong surgical internship at the New Bolton Center at the University of Pennsylvania, Dr. Nutt spent three years in a Large Animal Surgery residency at North Carolina State University, where he became skilled in all facets of equine surgery. 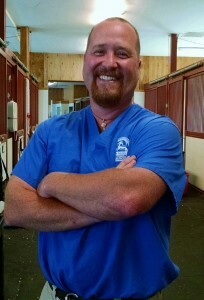 Until coming to Rhinebeck Equine in March 2010, he was the staff surgeon at Peninsula Equine in CA. Dr. Nutt has a strong interest in sports medicine and diagnostic imaging, including nuclear scintigraphy and MRI. He particularly enjoys the challenges of colic surgery, fracture repair, and arthroscopy, and has a special interest in laparoscopy and lameness. His areas of research while at the university included complicated fracture repair, transfixation casts, and external fixation. He has authored a number of scientific articles published in professional journals. Dr. Nutt is a Diplomate of the American College of Veterinary Surgeons, and a member of the American Association of Equine Practitioners and the American Veterinary Medical Association. In his spare time, he enjoys hiking, hunting and fishing, dog training, and falconry.